This book contains a number of articles inspired by the NATO Advanced Study Institute on 'Charged and Reactive Polymers l' held in France in June 1972. This general title indicates simply the intention of a series. The meeting dealt mainly with the fundamental problems of the physical chemistry of polyelectrolytes in solution. Some of the articles reproduce the lectures exactly as they were delivered. Some others have been modified to a greater or lesser extent, and this as a result of improvements or new inspiration arising from comments and discussions. In previous larger conferences on macromolecules, polyelectrolytes constituted only a marginal problem and few were the individual communications or short was the time al10tted to this subject. In other meetings of a biophysical character the uses of the techniques of charged macromolecules have been exposed with less attention given to the theories or to the creation or interpretation of these techniques. 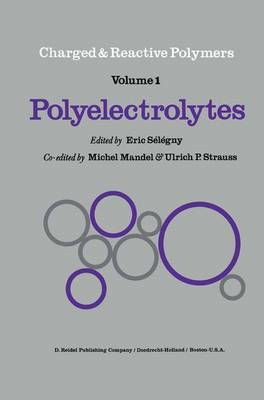 AU of us felt that the time had come to enumerate and to evaluate this increasing science of polyelectrolytes which has become of major interest. During the whole period of the Institute physical chemists discussed their mutual problems for more than a week, and of ten far into the night! One of the advantages of such an Institute is to enable the Directors and the mem- bers of the Scientific Committee to establish a logical order in the lectures; this order has been respected in the present edition.